I’m very excited about this special week coming. (Bzzzzzzz….Hummingbirds in my tummy.) 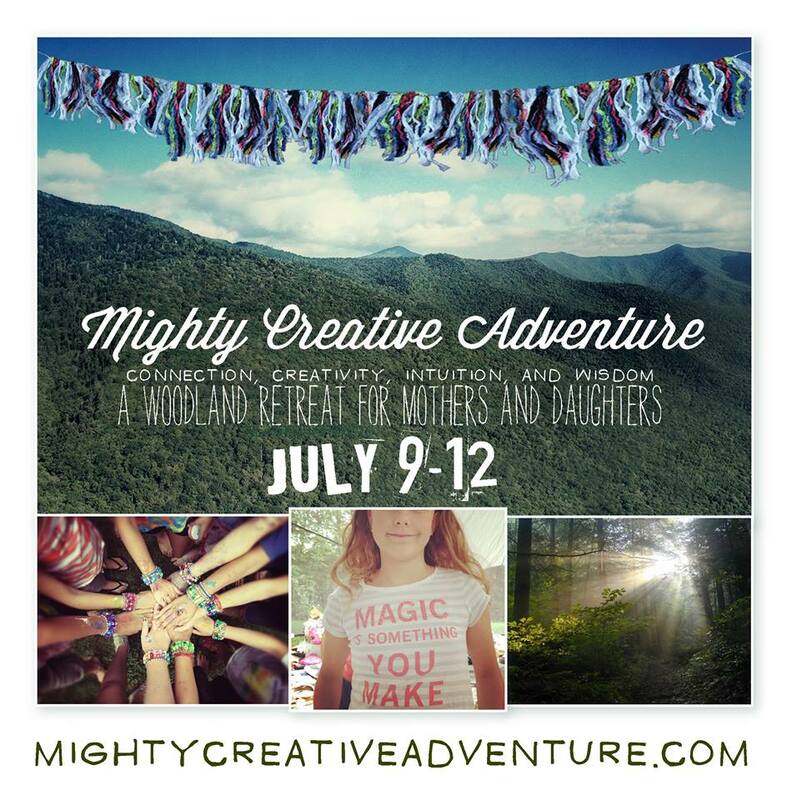 Our first ever, Mighty Creative Adventure™ will bring mothers and daughters together–new friends from far and wide–to share a new experience, co-create memories for four days and three nights at our enchanted forest in the North Carolina mountains. We will learn new things, make a few things, share old stories, enjoy some s’mores over our campfires, while activating the great beauty, power and creativity within us. How does this sound? We still have space for you and your mother (daughters ages 8 to 14 and mothers of all ages) to gather together to learn from each other, share, shine and LAUGH together as we adventure in a secret sanctuary located in the heart of the Pisgah National Forest, North Carolina–one of the oldest woodlands in America. Can you come? Can you join us? Can you join the Mighty Creative Adventure? It is not too late to say “Us too!” Much more info can be found at http://www.mightycreativeadventure.com or feel free to email me. We have one partial scholarship remaining, and a lodge room or shelter space for you. Oh, and yes, if you are flying we have a shuttle service to safely transport you from Asheville (AVL) airport to our secret gathering place. What do you think? How does this sound? Can you join us? Me, my daughters, my dear friend and partner in creativity Wendy Cook, and the other moms and girls this Thursday? Let me know. We’d love to welcome you to the Mighty Creative Adventure. There are LOTS of things bubbling in my heart as I’m planning the next few playshops for our creative girls AND for creative WOMEN too! For now, I have two invitations I’d like to extend, especially for women. A few times a year I am honored to offer playshops at A Place for Women to Gather. The next program is called “Lighting Her Moon” and is especially for mothers, grandmothers, aunts and other women who have a young girl in their lives. I created this program because it was something I wanted to experience myself, for my own daughters. This playshop will offer an opportunity for learning and sharing that I feel is very important for the health of our daughters, and for honoring our own female sacredness. This program shares ideas and traditions celebrating our daughters first menstruation and monthly moon time. It intends to spark ideas about how we can best honor our own girls’ transition into this special time in a girl’s life in our modern lives. We will explore different rituals and practices around the world honoring girls’ first menarche and her ongoing lunar cycles. The last portion of our time together we will create a hand-molded candle, reflecting the Navajo practice of molding, molding into the candle your intentions for strength, wisdom and courage for a young girl in your life. Dates/Times: Wednesday, September 3, 6:30–9 p.m. OR Saturday, September 6, 1–3:30 p.m. 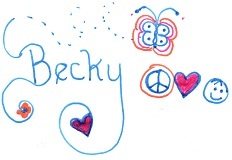 Please email me directly becky AT creativegirl DOT net to register. Many women have asked me to create creative GIRL playshops specifically for women … and the secret is out … I’m excited to share with you that I DO! Registration just opened for the fall Sacred Kindness Retreat. This special 4 day, 3 night mountain pilgrimage is offered twice a year for 13 women. The next one will be October 9th to the 12th. To see full information, please visit http://www.selfkindnessretreat.com . At this time there are 9 openings. Oooh, and I’m excited to tell you that I’ll be announcing the Fall Creative GIRL date later this week. It is such a joy and blessing to be able to create these beautiful programs that honor our daughters AND the GIRL inside of us. Thank you for seeing the beauty and importance of this –what I know in my heart to be– sacred work.